A fascinating stormy past, cities blessed by sunny days all year round and great food are only some of the reasons to travel to Andalusia, wonderful region in southern Spain. 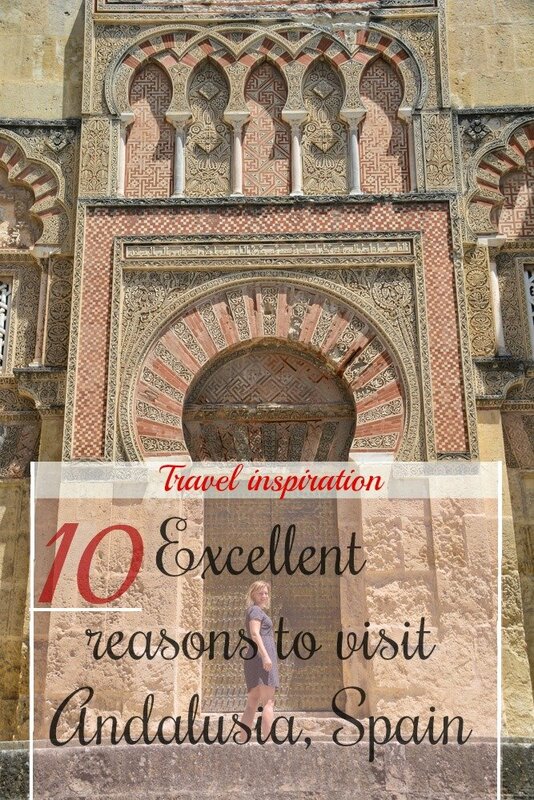 If you are still planning your next vacation, read on and get inspired to visit Andalusia. Andalusia is a place of wonder. Sunbaked and varied, with pockets of stunning beauty and surprising simplicity. While the countryside is stunning, it is the cities that we love most in this region. Steeped in history, they come in all shapes and sizes. Colorful and vibrant, just like the people of Andalusia themselves. Andalusia has a rich history in food, using surprisingly simple and basic ingredients. 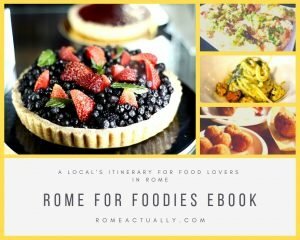 Whether fresh fish and seafood that finds its ways onto the plate within just a couple of hours or the rich and deeply satisfying dishes from the mountains, there is a so much to explore. Spanish meals can last for hours, preferably consumed in big groups together with friends and family. Try grilled sardines on a stick in Malaga, bacalao in Cadiz, or spinach and chickpeas in Seville. Andalusia’s cities have an amazing cultural heritage. No wonder, considering the Romans, Phoenicians, Visigoths, and Moors all passed through here at some stage in history. This becomes very obvious in the churches and old towns. Several UNESCO heritage listed sites are located in the region, but even if they are not widely recognized, there are still many sites you cannot help but fall in love with. For example, the Puente Nuevo in Ronda, the Alcazar in Sevilla, the Alhambra in Granada, or the Mezquita in Cordoba. –>> To experience two of Andalusia’s iconic landmarks (Alhambra and Generalife Gardens) without the hassle of crowds and with priority access, you can click here and book the special tour of Alhambra and Generalife Gardens in Granada. The Spanish love to spend time outdoors, and they do so preferably after sunset. Dinner is only served at around 10 pm, and before that, friends and family members will gather in bars and restaurants around the city center to share some tapas and have a glass of beer or wine. The traffic-free city centers of many historic cities in Andalusia are perfect for the mingling crowd. And in the friendly and cheerful atmosphere, even children are welcomed by all. If you picture Andalusia as a dry and dull country then you are utterly mistaken. The south of Spain can be surprisingly lush and beautiful. 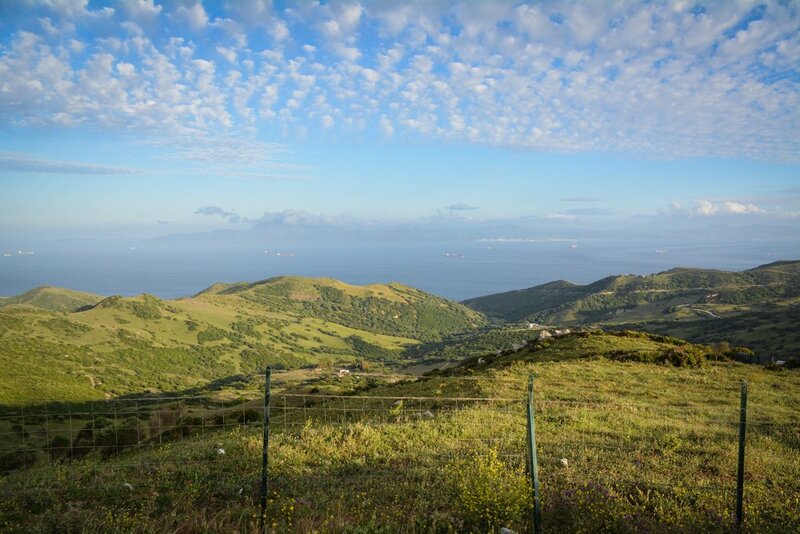 Thanks to the many mountain ranges and hillsides, there are some amazing viewpoints that you can explore and enjoy, for example, the views of the Costa del Sol from Mijas Pueblo, the city views from the Gibralfaro in Malaga or the views all the way to Africa from the Mirador del Estrecho near Tarifa. 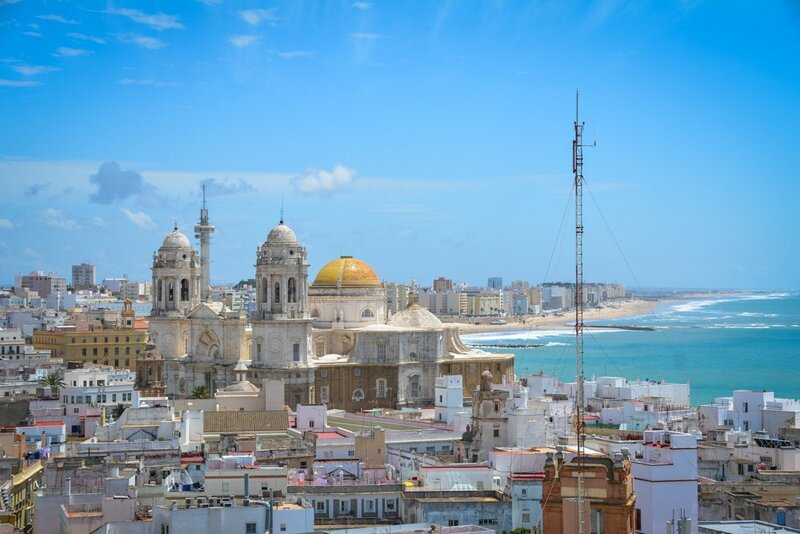 There are two types of travelers to Andalusia: those that only come to spend days on end on the beach in the popular tourist resorts, and those that prefer exploring the rich cultural heritage of the region further inland. However, there are also some stunning beaches in Andalusia that are not completely choked by mass tourism and that can easily compete with dream beaches all around the world. Take for example Playa Bolonia near Cadiz, Playa del Cañuelo near Nerva, or Playa de los Muertos near Almeria. It’s a little-known fact that Malaga has a fantastic range of museums and art galleries. In fact, the city just recently started promoting itself as a go-to destination to see fantastic local and international artwork. No wonder, once you remember that Malaga was the birthplace of Pablo Picasso. To escape hot summer days, take a tour of some of Malaga’s stunning museums, such as the Pablo Picasso Museum, the Centre Pompidou or the Carmen Thyssen Museum. Why are we recommending G Adventures tours? Because they are committed to sustainable tourism and their tours are carefully tailored. 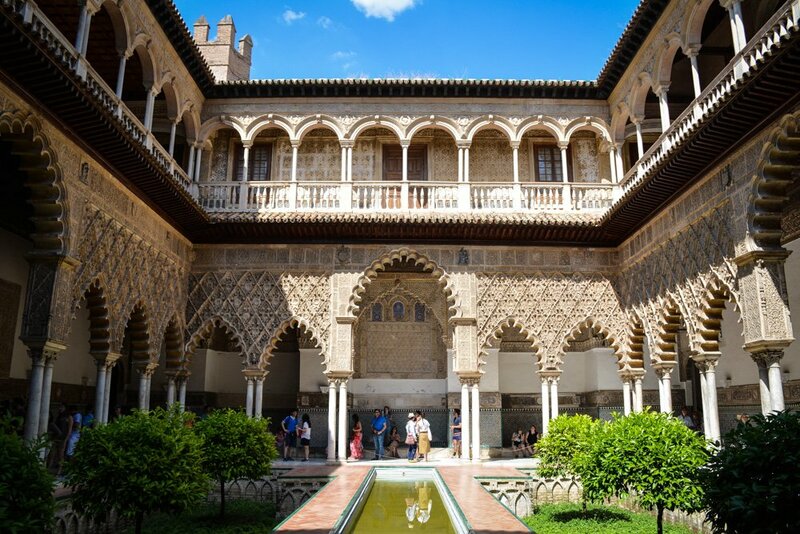 Spain is a gorgeous country with a lot to see, and this 8 Days Madrid to Seville tour will help you discover the history and romance of Andalucia in five beautiful cities. For children, Andalusia is a wonderland full of exciting discoveries and adventures. The warm climate and generally dry days are perfect to visit one of the many water parks and theme parks. The climate is perfect for movie productions, and there are many Western cities to explore. We recommend Isla Magica in Sevilla, Aqualand in Torremolinos, and Fort Bravo Texas Hollywood. The Spanish Easter celebrations are so unique, you really have to see them with your own eyes. As in other parts of Spain as well, there are many processions and ceremonies in the lead-up to the Easter weekend. During the processions, members of the confraternities carry so-called tronos with statues of saints through the cities’ streets. Clad in peaked hoods they look like otherworldly and mysterious creatures. One reason why we love Andalusian cities so much is their quaint and mostly traffic-free old towns. Like a maze, with winding streets and tiny squares, they cover enormous parts of Spanish city centers, perfect for exploration by foot – even when you travel with small children. We adore the old town of Cadiz, but also the Albayzin in Granada is simply stunning. Visit during the height of summer and you will probably be the only one exploring the quiet laneways during the day. There are some absolutely amazing villages in Andalusia that you must include on your Andalusia road trip itinerary. Most of the “White Villages”, they come in a variety of settings. 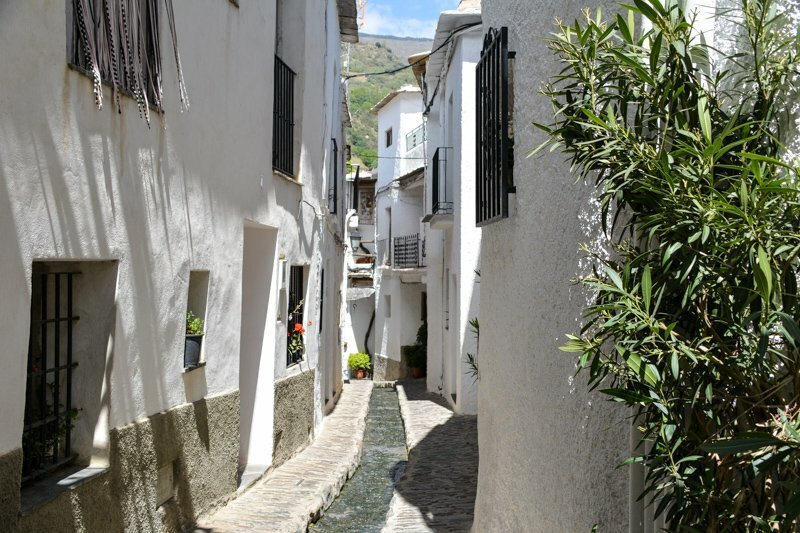 Visit the remote villages of the Alpujarras for scenic mountain views off the beaten path. Wander the streets of classic white villages like Frigiliana or Mijas Pueblo. Or fall in love with the cave village of Setenil de las Bodegas. Silke is a German-Australian travel blogger located in Malaga, Spain. She is a storyteller and a photo ninja, curious by nature and addicted to travel. With her travel blog Happiness and Things she wants you to look deeper into a destination. Seville. Located in a prestigious location near Seville’s Real Alcazar, the luxurious Hotel Alfonso XIII offers state-of-the-art amenities in an elegant Arabian-style design. Its amenities include a gym, an outdoor swimming pool, and a paradise garden. If you like to live in historical mansions, a lovely option is 5-star hotel Casa del Poeta, near Seville’s Cathedral and Giralda Tower. WIFI, a minibar, comforts, and toiletries in the modern bathrooms add to the experience. To stay in a traditional Andalusian house, pick 16th-century mansion Casa Imperial Hotel and walk through colorful tiles, stone archways and fountains. A romantic break in a typical Moorish style. Cordoba. Treat yourself with boutique hotel Patio del Posadero in Cordoba, conveniently located among important landmarks such as the Mezquita and the Roman Bridge. Recently renovated, this 15th-century residence is now a stylish hotel with modern facilities and a swimming pool. A scenic rooftop terrace with views of the city is part of the luxurious experience at the Balcón de Córdoba hotel. Located in the very city center, it offers all comforts and cutting-edge amenities. If you really are into luxury, you don’t want to miss Las Casa de la Judería de Córdoba, a fantastic hotel built in two houses a stone’s throw from the city’s Mezquita. Here you can enjoy a snack bar, an outdoor pool and modern facilities surrounded by wonderful settings. Granada. Historic house beautifully revamped in traditional Andalusian style, Santa Isabel La Real is a luxurious hotel in Granada with great views on the Alhambra. Rustic and elegant, this hotel features modern amenities and comfortable rooms. For a small and cozy boutique hotel, try the lovely Gar-Anat Hotel, recently renovated but keeping in mind the original architecture. The spacious rooms are fully equipped with modern comforts. Do you want to treat yourself? Parador de Granada is a 15th-century convent turned into a luxurious hotel in Granada. The air-conditioned rooms feature internet access, flat-screen TV, and fully equipped bathrooms. Malaga. If you want to stay in Malaga for more than one day to enjoy more of what the city has to offer, there are many hotels you can pick from. Parador de Malaga Gibralfaro is a lush hotel proudly standing literally less than 10 minutes walk from the beach and near the Moorish Gibralfaro Castle. Surrounded by greenery and great views of the city to be enjoyed from the terrace, Parador offers also a swimming pool and a traditional restaurant. For a nice design hotel in Malaga city center, a great option is Petit Palace Plaza Málaga. Set in a 20th-century mansion, Plaza Málaga is located between popular pedestrian streets and important historical landmarks such as the Cathedral, the Picasso Museum and Carmen Thyssen Museum. The hotel comes with laptops and free WIFI in every room and bathrooms and showers have hydromassage facilities.